In December, I wrote about New Year's resolutions and why so many of them are forgotten before the next new moon. (If that's you and you want to be successful in achieving your New Year's goals, click on the blog here.) One of the most popular resolutions is to "eat healthy, exercise more and lose weight" -- and that's also the resolution that's the most likely to bite the dust before dinnertime. A lot of people know that I used to be 85 pounds heavier than I am today. During the years of Big Matt, I tried a kazillion diets and exercise plans. They would work for a time and I'd lose a few pounds, only to be seduced by a killer apple pie ala mode or a five-course Italian meal. But there was one particular event that was the turning point for me, a moment in time when I knew there could be no retreat. Seeing me today and knowing how much I've lost, people often ask me what diet I used or how often I work out. And I tell them it doesn't matter. Because the real reason I lost all that weight was because of the magic thing my wife, Sumi, said to me one day. I can just hear all of you husbands and wives out there saying, "Yippee! So there really is a magic formula, something I can say to get him or her to do what they should be doing!" Well, yes and no. Here's the story in a nutshell: I was teaching one of our courses and the topic was health and fitness. I was on fire! I nailed point after point and had the audience eating out of my hand! When it was over, I rushed to the back to see Sumi and said, "That was fantastic! What did you think?" Of course, what I really wanted to hear was, "You were amazing!" But by the way she paused and looked at me, I knew that was not gonna happen. Uh oh. Sumi looked me straight in the eye and said, "Matt, you know I love you just the way you are and always will. I want you to consider whether you are being truly congruent with what you're encouraging your students to do in health and fitness. You've always walked your talk in anything you teach. Are you really doing that in this area?" So though it took the wind out of my sails for a second, I knew Sumi was coming from a place of wanting the best for me. She didn't tell me what to do (when has that ever worked?!?) She simply asked me a heartfelt question and let me decide what to do about it. And that was the catalyst. I know a lot more about setting and succeeding with goals now than I did back then. But even back then, it seemed like I could achieve just about anything in all other areas -- relationships, career, finances, etc. -- yet I still waffled around when it came to my health and fitness. Real Motivation: As Sumi pointed out, one of the most important things in my life is to be authentic and congruent with what I teach. When I set and met my financial goals, it was not just for a new Rolex or even just to give my family a better lifestyle. I did it because, if I was going to stand in front of the room and teach others how to be financially prosperous, it was important for students to see that I had actually done -- and succeeded at -- what I was teaching. My most meaningful teachers and mentors all lived what they taught. I respect that and don't think I could teach any other way. New Identity: Before the conversation with Sumi, I had been making the mistake that many of us make: I was trying to get Big Matt to lose weight. Big Matt does not lose weight. Big Matt likes Big and all the ways that Big eats. Big Matt does not like to go to the gym. Big Matt prefers his Oreos and milk on the couch watching the game, thank you very much. Wrestling Big Matt to the ground to get him to be healthy was nearly impossible! 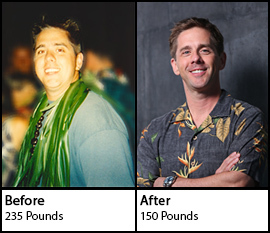 Rather than experiencing my true self as Big Matt, it was important for me to shift that identity to Matt the Healthy, Slim and Strong. Matt the Healthy, Slim and Strong knows exactly what to eat and really prefers healthy foods. This Matt enjoys exercise and challenging himself physically. As with all shifts, shifting your identity isn't just about empty affirmations. It requires engaging the unconscious. So what's the take-away here? If you are the one who would like to encourage change, nagging won't help. Being lovingly honest with your partner while not expecting or demanding change might be the catalyst they need. If you are the one wanting to change, apply the tools from last month and add the extras from this month. Dig down and find your most compelling motivation. Get help if you need it to release old baggage. Begin to see yourself as who you are becoming rather than who you have been. Matthew B. James, MA, Ph.D., is President of The Empowerment Partnership, where students learn Neuro Linguistic Programming (NLP), Huna and Hypnosis. To learn more about Mental Emotional Release® Therapy (aka Time Empowerment®) click here.